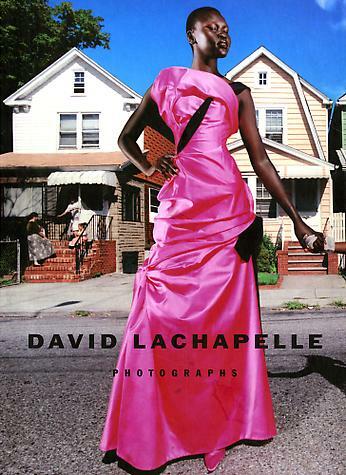 Since the mid-90s, David LaChapelle has acquired a dedicated cult following on both sides of the Atlantic. His output is prolific and this fine, comprehensively illustrated book, a record of the most agreeable and productive collaboration between ourselves and KunstHausWien, LaChapelle’s Studio and the Tony Shafrazi Gallery in New York, is evidence of the sustained level of creativity he has achieved over the last ten years. We would first and foremost like to thank the artist for his co-operation and enthusiastic support. At an early stage in the project, Sandy Arrowsmith at his Studio, and Hiroko Onoda, at the Tony Shafrazi Gallery, New York, were both enormously helpful in making the exhibition possible. More recently, we have been assisted by Claudette Vlcek at the photographer’s Studio in New York. If one extreme in photography is exemplified by the diaristic photography of Nan Goldin and the disturbing realism of Larry Clark, then LaChapelle must surely be amongst those who dominate the other – deliberately playful, highly polished – escapist even. Often compared to Fellini, LaChapelle recreates the carnivalesque world of dreams and self-exposure and makes it iconic and accessible. This exhibition further illustrates our ongoing commitment to photographic art. Since the Barbican opened just over twenty years ago our exhibition programme has been greatly enriched by the regular presentation of influential solo shows; Cecil Beaton, Man Ray, William Eggleston, David Bailey and Helmut Newton amongst others. It is a privilege for us now to be able to present for the first time in Britain this exhibition by one of the most innovative and brightest stars of contemporary photography, David LaChapelle.